Notes: Opened in 1889 and owned by the Federation Burial Society. The land was previously owned by Montague Samuel (see ID: I3953) Ist Baron Swaythling in Jeremys Green Lane, Edmonton, which is now known as Montagu Road, was presented to the Federation of Synagogues as a burial ground. The first burial was on 16 April 1890. Status – Headstone photos: incomplete. 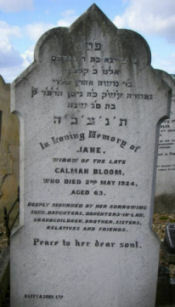 Visiting arrangements: this is an open cemetery, see http://www.federationofsynagogues.com/contacts/ for more information.